These little jewels can be some of the most rewarding of all orchids. Here in Southern California they will survive outside with very little effort. Sure they will freeze back some when it frosts, but they will branch and come back even stronger for it. The flowers if looked at carefully are a perfect miniature of the larger Cattleya orchids. The flowers come in bunches on the end of the stems, but the stem keeps getting longer and longer so that flowers are produced almost all year round. Only a frost will stop them. These grow great in full sun in planter bed with excellent drainage. Beds are usually raised to provide that extra drainage an orchid needs. The plant grows long and tall and flowers almost every inch of the way. A planter mix that is full of bark and humus will work very well. Foliar feeding will work best, as many of the roots are above the soil. They will take their nutrition from the water as it passes. Many persons grow Reed Stem Epidendrums in a large wooden box or clay tub out on the patio, again in full sun. If you want them to grow strong and healthy, lots of sun will do it. Without strong sun they have a tendencey to grow tender and weak. Tying them up is a necessity as they will not stand by themselves if it is too shady. Even in full sun it is a good idea to have a strong stake in the center of the plant. Most of the time they won't need it, but a strong wind will bend them over without it. The most common color is orange, but they are found in a wide variety of color now. You will find in your travel, orange, pink, red, bright red, lavender, etc., if you just ask around a little. They have been widely hybridized with other compatible orchids and there are many things on the market now captializing on the hardiness of these plants. 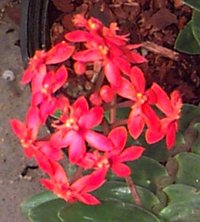 Epi-catt is probably the most prevalent, with some producing flowers two or three inches across. This type of hybrid brings the plant size down considerably, and also the flower count drops. The flowers however are much bigger and wider color range can be found. If you visit the San Diego Zoo on the third Friday of any month, you will find several planters filled with these orchids all around the greenhouse area. They are also scattered through out the Zoo here and there. The planters near the greenhouse area have been there for many years and contain just about all the colors available. Flowers can be seen any time of the year with spring through fall being the heaviest flowering time. For more information on reed-stem epi's go to the AOS article by Andy Phillips and Cynthia Hill.